Some school districts and other public and private entities want to provide free community access to their recreational facilities without a formal partnership or agreement with another party. They may also want to allow for community use beyond group programs hosted by third parties, such as sports leagues. “Open use” is a promising strategy to achieve these goals. An “open use policy” allows school districts and others to formally grant community access to their facilities and set forth the roles, rights, and responsibilities of all involved. While open use can and often does occur on an informal basis, an open use policy can help clarify the parameters of the community use and ensure continued access. Learn more about how the Board of Education in Hamilton County, TN passed an open use policy for the district’s elementary schools in this case study. ChangeLab Solutions has created a variety of tools for you to learn more about open use. 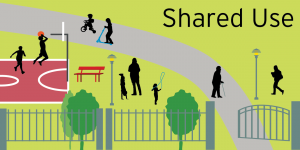 Contact us to learn more about open use and be sure to check out all of our related shared use resources. School districts can use our model policy to formalize community access to district recreational facilities. This resource provides model policy language for school districts, outlines legal issues for them to consider, and includes a checklist to help with policy development and implementation. 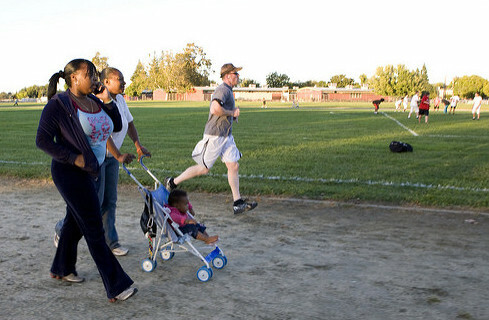 Just as faith-based congregations often serve their communities through food pantries, after-school programs, meal programs, and other services, many now see shared use of otherwise underused or unused recreational facilities as a promising and cost-effective way to enable both congregants and community members to be healthier.